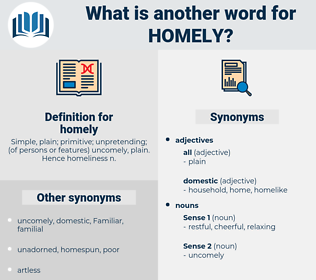 What is another word for homely? 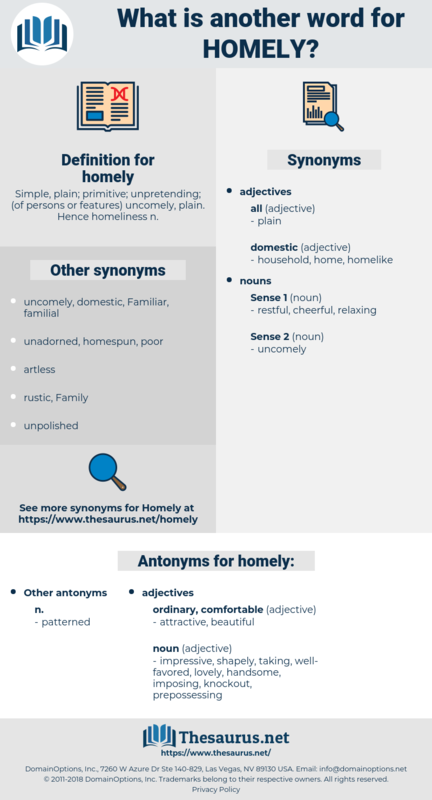 Simple, plain; primitive; unpretending; ( of persons or features) uncomely, plain. Hence homeliness n.
snug as a bug a rug. impressive, shapely, taking, well-favored, lovely, handsome, imposing, knockout, prepossessing. This phrase fastened itself in Dorothy's mind, and she determined to take for her line of action all that was expressed in Mr. Bill Hodges' homely phrase, " Treat'em good, but not too good." Such was the simple, homely stage - setting.